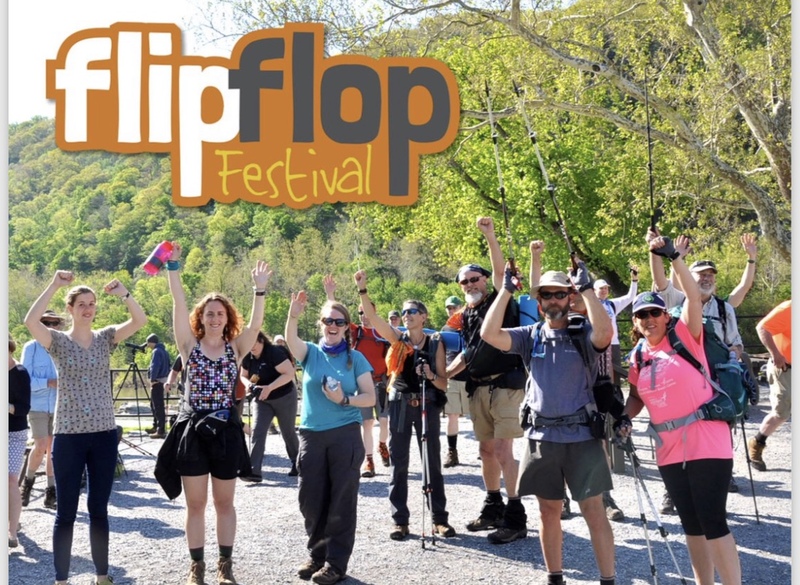 The 5th annual Flip Flop Festival will once again see Appalachian Trail thru-hiker hopefuls off as they begin their hike across the Appalachian Mountains. The festival will be held Saturday, April 27 and Sunday, April 28 in Harpers Ferry, W. Va. It is open to the public and free. In addition to seeing off some of the Appalachian Trail Class of 2019, the festival offers several hiking and outdoor enthusiast workshops, good eats and camaraderie for the outdoor community. The event officially kicks off on Saturday, but is offering one-on-one backpack shakedowns as a pre-workshop on Friday, April 26, from 3-6 pm. For the uninitiated, a shakedown is where an experienced hiker helps another hiker lighten their load by sifting through their gear and seeing what items are unnecessary for the trail ahead or can be replaced by more lightweight options. Reservations are required for these Friday sessions. Several workshops on Saturday make for a jam-packed day of outdoor education. Workshops include Hiking for Beginners, Leave No Trace Ethics, Bicycle Touring, Introduction to Birding and others. Sunday begins with a Hiker Pancake Breakfast at 7:30 a.m. The official AT hiker sendoff is at 9 a.m. at the Appalachian Trail Conservancy Headquarters, located at 799 Washington St, Harpers Ferry, WV 25425. Sunday’s schedule also includes Backpacking Food and Nutrition, Best Foot Forward: Care for Your Feet, Hiker Hacks, guided history hikes, and ends with a night sky viewing program. Gear specialists from REI will host a gear clinic and will offer on-trail gear repair tips. Expect live music, and vendors will have food and drink. The Flip Flop Festival encourages a “flip-flop” thru-hike of the Appalachian Trail. The term “flip-flop” is hiker jargon for completing a thru-hike by hiking an alternate itinerary or sequence. It is typical to hike a trail either completely northbound or southbound, but a flip-flop hike is a mix of both. The combinations are endless, and are up to the hiker. There are benefits to a flip-flop thru-hike, such as capitalizing on weather conditions in certain sections of trail, avoiding crowded areas and starting in moderate terrain, which is what this festival promotes. Here’s more on why the ATC encourages flip-flopping, plus suggested itineraries. The schedule for the event is Friday, April 26 from 3 p.m. to 6 p.m., Saturday April 27 from 8 a.m. to 7:30 p.m. and Sunday, April 28 from 7:30 a.m. to 9:30 p.m. The festival is centered on Camp Hill, above the Appalachian Trail Conservancy Headquarters, 799 Washington St. in Harpers Ferry, W. Va., 25425. This festival is organized by the Appalachian Trail Conservancy (ATC), the Trail & Town Alliance of Harpers Ferry and Bolivar, REI Co-op, and Harpers Ferry National Historical Park.